Home Tutorials What is a NAT Firewall? While researching VPN providers for the best option, you may have noticed that some companies offer NAT firewalls. In this article, we will discuss what exactly a NAT firewall is, so we can help you understand why would it be useful to have. NAT stands for Network Address Translation. It is the process in which a network device (most likely a firewall), assigns a public address to a computer(s) within a private network. Essentially, a NAT’s task is to limit the number of public IP addresses that an organization with many computers needs to use. This allows a company to save money and be able to ensure the security of its network more efficiently. Its also used in home Wi-Fi routers to allow multiple devices to connect to the internet using one external IP. As an example, think of laptops, mobile phones and tablets. A Firewall is what stands between a secure Local Area Network ( LAN), like your home Wi-Fi, and the internet. 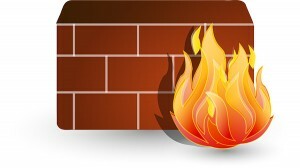 The main purpose of a firewall is to control the communication between the LAN and internet. This is done through data packet analysis which is carried out to determine how they should be handled. Firewalls can stop malicious packets from making their way into your computer. Firewalls can come in two different forms: software and hardware. What is usually targeted for personal computers is, you guessed it, ‘Personal Firewall’. The majority if Operating Systems include some kind of personal firewall. The NAT process discards IP packets that are not recognized, making it an effective protection against unrecognized inbound traffic. This makes it a simple yet effective firewall that protects your computer while you are connected to internet. Why do you need NAT firewall when using a VPN? Given that most routers already include at least basic NAT filtering, you may wonder why some VPN providers offer it as part of their service. Usually when you are connected to the internet using a router, this device acts as a hardware firewall to provide protection against malicious attacks. However, when you use a VPN, the encrypted VPN connection between your computer and the VPN server also tunnels through the NAT firewall. This ends up meaning that the firewall is not able to read these encrypted packets. As such, when you use a VPN, the NAT firewall is not effective and malicious packets could access to your system. VPN providers that include NAT firewalls place this protective process between the VPN server and the internet. That way, all online traffic is filtered through the NAT firewall. It’s pretty useful. While your Operating System’s built-in firewall offers a good solution, it’s worth considering using additional protection. A NAT hardware firewall does not only provide extra security but also filters out a large number of potential threats. That’s even before it gets to another firewall that would prompt dialogue boxes from your system for a connection. While most desktop Operating Systems usually include firewall protections, third-party firewalls solutions could be the best option. This particularly true for mobile phones, as these devices do not really have built-in firewall protection. Some VPN providers also offer included or additional paid NAT firewall options. Private Internet Access includes a NAT firewall security layer on all plans, while PureVPN sells NAT firewall security as an add-on. It is not a necessity to use the extra layer for most users, but if you wish to secure your data as much as possible, it’s certainly worth it.